In honour of the magazine’s 10th anniversary, we present The Avenue. A spritz is a lovely thing. It’s a classic aperitivo cocktail, meant to help ease from a long day before the evening begins. It’s a drink meant for celebratory transition, so what better cocktail to celebrate an anniversary? For the last 10 years, Avenue has celebrated the people, the food, the architecture, style and stories of our city, and, for its 10th anniversary, it seemed only right that the inspiration be shared in a celebratory drink. Cue the Spritz, which calls to mind images of easygoing, warm evenings. It could be a bike ride through the river valley, a walk through the 124th Street market, or even just sitting in a friend’s backyard. Knowing that the heat is so short-lived is what makes these moments so much sweeter. Winter’s always just around the bend, so shouldn’t we make the most of our time in the sun? From the rich, floral sweetness of locally-harvested honey to the bright herbal notes of sage, rosemary, and dandelion, the flavours of the Capital Region shine. A white balsamic reduction makes sure nothing is overly sweet and everything gets along swimmingly. Strawberries and rosewater combine with the herbal elements to create an enticing aroma, drawing you into the drink. Cocchi Rosa- and Bonal-fortified wines provide accenting elements of rose and bitter gentian. Eau Claire distillery’s EquineOx eau de vie pushes those floral aromatic qualities of the drink into overdrive, while Belvedere vodka provides a rich, elegant base – letting other flavours shine in combination. Topped with soda, and garnished with fruit and herbs, the nose on The Avenue is impressively floral and fruity. Like that moment at the start of a warm evening, when you realize there are still greater things to come. A refreshing, effervescent palate brimming with herbal character and welcome bitterness makes for a complex Spritz you need to stop and take a minute to enjoy. Combine all ingredients over ice in a white wine glass and briefly stir. 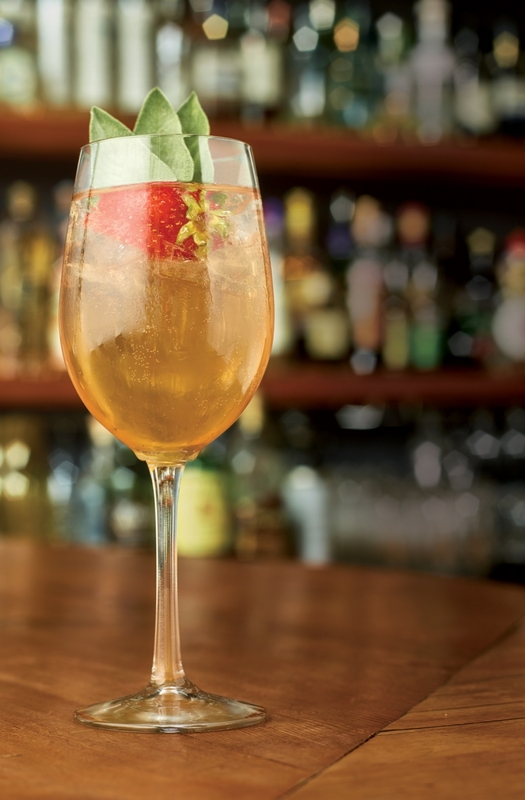 Top with soda water and garnish with a sliced strawberry and two fresh sage leaves. Combine water, honey, and vinegar over medium heat. Remove from heat and add rosemary and dandelion greens. Bottle and refrigerate. Will keep for 2 weeks.